There is a beauty in discovery. There is mathematics in music, a kinship of science and poetry in the description of nature, and exquisite form in a molecule. Attempts to place different disciplines in different camps are revealed as artificial in the face of the unity of knowledge. Glenn Theodore Seaborg (April 19, 1912 – February 25, 1999) was an American chemist who won the 1951 Nobel Prize in Chemistry for "discoveries in the chemistry of the transuranium elements". He was the principal or co-discoverer of ten elements: plutonium, americium, curium, berkelium, californium, einsteinium, fermium, mendelevium, nobelium and element 106, which, while he was still living, was named seaborgium in his honor. He also discovered more than 100 atomic isotopes and is credited with important contributions to the chemistry of plutonium, originally as part of the Manhattan Project. He advised ten presidents from Truman to Clinton on nuclear policy and was the chairman of the United States Atomic Energy Commission from 1961 to 1971 where he pushed for commercial nuclear energy and peaceful applications of nuclear science. Throughout his career, Seaborg worked for arms control. I suppose that I should say a few words with respect to the possibility for future production and identification of additional transuranium elements, especially in view of the possibility of their production by heavy-ion bombardment of transuranium elements. As an aid to such a program the radioactive properties can be estimated, as I have already indicated, on the assumption of a smooth nuclear energy surface and the systematics of radioactivity. Again, I must emphasize that such considerations are negated in the event that a stable subshell of 148 neutrons should be found to exist, and this must be regarded as a definite possibility. It is interesting to note that our considerations on the systematics of spontaneous fission28 indicate that this method of decay will not compete seriously with radioactive decay until the region just beyond element 100. … These considerations illustrate clearly that one of the problems is that of conceiving means for producing nuclides of sufficiently high mass numbers with half-lives long enough for chemical identification. Thus, the serious problem is again the paucity of starting materials. To say that Seaborg had a high-profile career is an understatement. He is in the Guiness Book of World Records for having the longest entry in "Who's Who in America." … In 1944, Seaborg formulated the 'actinide concept' of heavy element electronic structure which predicted that the actinides – including the first eleven transuranium elements – would form a transition series analogous to the rare earth series of lanthanide elements. Called one of the most significant changes in the periodic table since Mendeleev's 19th century design, the actinide concept showed how the transuranium elements fit into the periodic table. 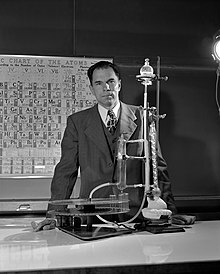 The body of information assembled in Dr. Seaborg's laboratory has made it possible to predict the radioactive characteristics of many isotopes of elements still to be found. Under Dr. Seaborg's leadership, also, whole new bodies of methodology and instrumentation have been developed and have become a cornerstone of modern nuclear chemistry. Glenn Seaborg had a tremendous influence on me — both before and after I met him. Of course, as a nuclear chemist, I knew of his leadership in the legendary discovery of plutonium in 1941, the development of the actinide concept, his receipt of the Nobel Prize in 1951, and the discovery of 8 more transplutonium elements by 1958. It was not until his tenure as chairman of the AEC (1961-71) that I actually began to learn first hand about the "real" person behind these awesome accomplishments. … The breadth of his interests, his skill in communicating with both scientists and the general public and press, and his energy in doing all this even while he was AEC chairman still boggles my mind! … I learned so many things from him just by observing how he ran the weekly brown bag lunches with his graduate students and later mine — listening with great interest as they described their research progress. He asked insightful and penetrating questions, but not in a threatening manner, made suggestions, and frequently went to visit the labs late in the day to see what was going on. He also hosted many undergraduate research students. He was devoted to education and student training and would prepare as carefully for lectures to freshman chemistry classes as for presentations to prestigious assemblages of scientists. Glenn was very concerned with history and had kept a diary or journal since he was eight years old. After his return to Berkeley from Washington in 1971, he continued the tremendous undertaking of putting them into book form, which occupied him and several helpers for many years. His journals also formed the basis for books on his years as chancellor at Berkeley, as chairman of the AEC, and many other topics. On the rare occasions that he did not remember something that one of us might ask about he would look it up in his journals. He had a fabulous memory and was able to synthesize and apply and keep track of what he knew so it could be applied to the situation at hand. One might almost say in the parlance of our time that he was a "parallel processor"! … In spite of his legendary accomplishments, Glenn Seaborg always had time for family members, colleagues, students, and even non-scientists who wanted to visit with him. We have lost a treasured advisor, colleague, mentor, resource, and friend. But he will live on through his prolific writings and in the cherished memories of the hosts of students, scientists, colleagues, and lay people that he influenced. Dr. Seaborg was a true giant of the 20th Century, a legend in the annals of scientific discovery. His daily commitment to matters of the laboratory, even in retirement as associate director-at-large and as an active researcher, was an inspiration to us all. … We who have been touched by his wisdom, his energy, and his tireless devotion to our profession will miss him. This page was last edited on 16 April 2019, at 16:24.